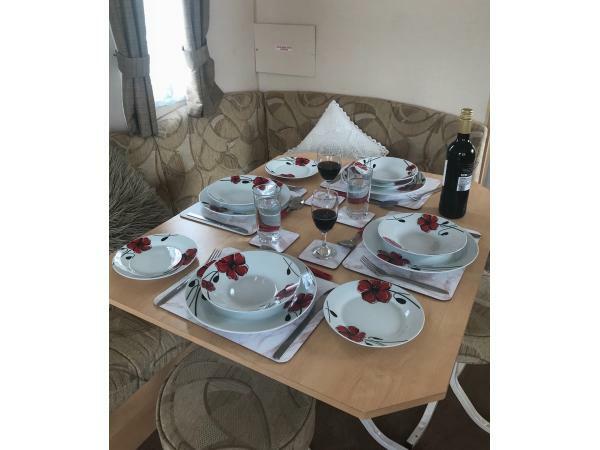 Additional Info: The kitchen is fitted with several cupboards, full-size gas cooker with 4 rings, fridge freezer plus all cooking utensils, crockery & cutlery is provided. There are two bedrooms, (one double & one twin) both have wardrobes. There is also a pull out bed in the living area. Duvets, pillows, bed linen towels are provided. In the living area there is a dining table, banquette seating, stools, storage, TV and DVD player provided together with a range of DVDs to choose from. There are also some board games provided. There are fitted smoke and carbon monoxide alarms. Outside there is a seating area with an outdoor rattan table & chairs. The caravan is accessed via 3 steps. Due to owners allergies, the security deposit of £50 will NOT be refunded if there is evidence of smoking or pets in the caravan. Other arrangements may be acceptable for last minute bookings and for bookings made as a result of cancellations. Prestatyn town centre (just 10 minutes walk away) boasts a train station, plus an excellent mix of traditional & big name shops plus bars, restaurants and cafes. There is a family friendly pub just a short walk from the park entrance, The Beaches pub and restaurant is just a ten minute walk down the seafront . All this makes it the perfect location to explore beautiful North Wales. There is an outside table, chairs and outdoor box which contains an inflatable dingy which you may use but at your own risk, and extra fold up chairs. This site does not allow singles parties. It is a quiet site which does not allow loud music after 11pm. Just £50 non-refundable deposit is required when booking and the total payment must be made 6 weeks prior to arrival. If booking within 6 weeks of your stay you will be required to pay the full amount at the time of booking. In addition a £50 security deposit will be required before the commencement of your stay (for breakages and damages and loss of keys/parking pass) this will be refunded once the caravan has been checked. There will be someone to meet you on your arrival and departure who will provide you with information and check for damages/breakages/losses. We are also available by telephone during your stay if you require any assistance. Payment plans available but must be complete 6 weeks prior to the commencement of your stay. Contact owner directly for more detais of pricing and availability. Thank you for taking time to give valuable feedback. I appreciate you comment on some of the pillows as you pointed out I have ordered some new ones that sadly hadn’t arrived on time for the next guests. It is my aim to please and provide the best service I can. I have only had the caravan for a short time and am constantly striving to make improvements in order to make stays more comfortable for guests. Over time I aim to replace equipment that is showing signs of aging whilst at the same time providing a home from home where families can feel relaxed. I look forward to welcoming you back in the near future. 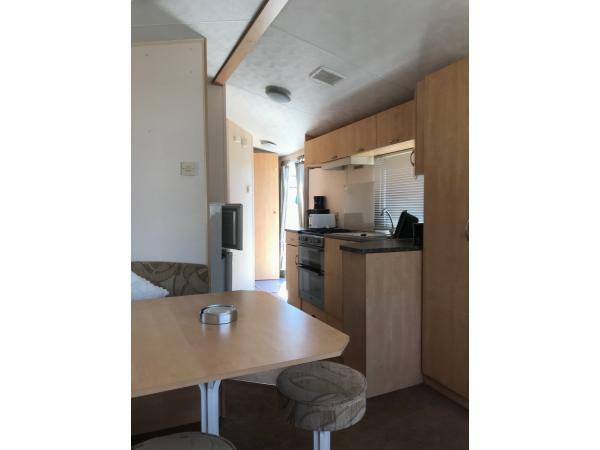 The caravan is located in an excellent secluded position on the park. It is excellently equipped, ecen has a cafetiere as I love my freshly brewed coffee in the morning. My wife & I went for a last minute short break. Mrs McGuire couldn't do enough for us and was professional throughout the booking process. Not only did she greet us with her Irish smiling eyes and a little pack with some tea bags, instant coffee, milk, bottled water so we could refresh ourselves on our arrival. There was also hand soap and a litrle washing up liquid to get us started. The caravan was spotless and well presented on our arrival. Mrs McGuire left lots of cleaning materials in a cupboard so we could keep the caravan cleaned and maintained to my wifes standards without any expense to ourselves. All bedding & towels plus t towels and beach towels are provided. As we left the caravan as we found it Mrs McGuire refunded our deposit immediately following her inspection of the caravan. Prestatyn itself is a lovely town and a fantastic base for exploring the Welsh coastal areas & country side. We will be back and sooner rather than later. Our daughter is hoping to go with her young children once the busy school holiday period is over. Thank you so much for the glowing review , I am glad the cafetière helped enhance the enjoyment of your break. It was a pleasure meeting you and your wife and I look forward to welcoming you back in the near future.